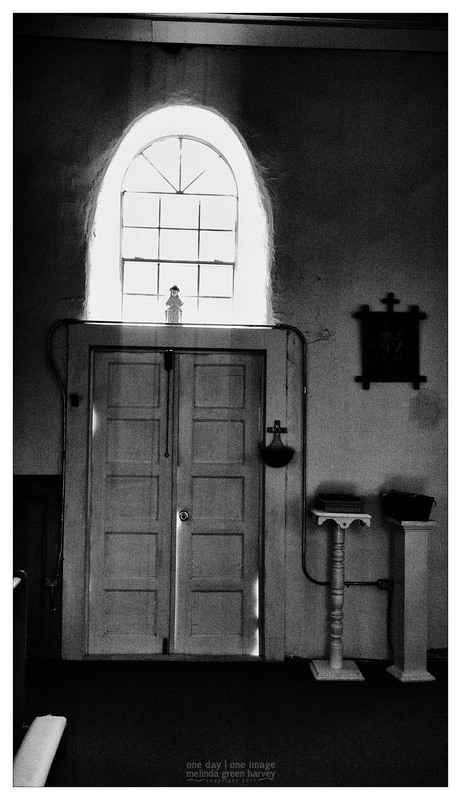 After I was through inside the church – this was the last interior photo I made – it was time to walk around the building. As I made it around to the side that faces the highway, I saw him. The monk. He was on his way to the mailboxes. In a minute, he came down the hill, and stopped for a chat. He talked about the town, the Mennonites who live just across the border in Mexico, the weather, Minnesota (where he’s from), a 1940 murder at the liquor store* and showed me the bullet holes, and gave me directions to the cemetery. But you know what? I never told him about the icon, partly from residual shyness that still pops up from time to time, and partly because it seemed a little too fan-girl. Posted on November 23, 2017, in Photography and tagged 365 photo project, black and white photography, church, journey, learning to see, Leica, melinda green harvey, monochrome, Mystery, one day one image, photo a day, photography, postaday, road trip, Sahfter, shafter texas, texas, thoughtful seeing, travel, travel photography. Bookmark the permalink. 8 Comments. Thank you so much. You’re right that transitory encounters can have great impacts. I guess we just have to keep our minds always open to those possibilities. That’s how the light gets in ! ( per the late LC ) Amazing shot MGH. Well, look at you catching that song reference! This image was my favorite one from the church.